Let’s travel to Hong Kong – spontaneous idea born in one evening after finding a cheap flight online. Two weeks later we were on the plane. Before our trip we didn’t do a proper research, we didn’t read about getting around in Hong Kong. So I thought that we will get lost at some point for sure. Or at least we will be confused with public transport system in Hong Kong. Why? ‘Cause it’s region of China. And it’s our first experience with China. There will be a lot of people, a lot! More than in India! And then, of course, their writing. We can’t read it! But in reality everything was different. 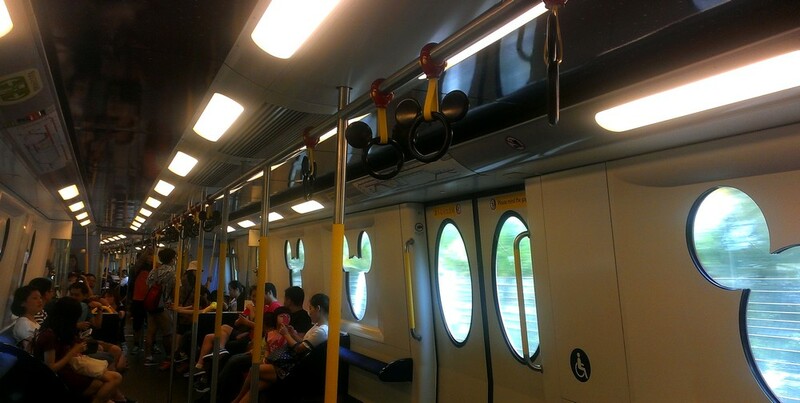 It turned out that Hong Kong public transport system is very well organised and understandable for everyone. First of all I want to mention that one of the official languages in Hong Kong is English, so every sign is in English, too. And that helps a lot. Metro system in Hong Kong is well organized and easy to understand. Prices are rather low – for shorter distances we paid about 0.5 EUR, long distance metro ride cost us about 2 EUR. Exception is metro ride to the airport. Same like in other cities around the world is much more expensive. In Hong Kong getting to the airport by metro costs about 10 EUR. There is a separate metro line which goes from Hong Kong island to Hong Kong Airport, without any stops. In the station where you board a metro train to the airport you can even check in to your flight and leave your checked luggage there! This is convenient indeed! While walking on the streets of Hong Kong island we saw quite an odd and unseen vehicle, which looked like an overturned matchbox. And that odd vehicle was – two story tram! Needless to mention that we were curious and eager to ride it. So we hurried to the tram-stop and waited for the next tram to arrive. 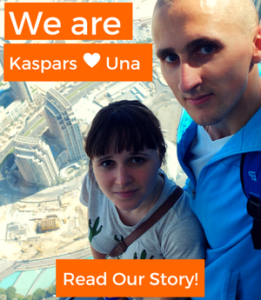 Ticket price is low – then it cost us only 0.23 EUR. And doesn’t matter how far you go – one stop or till the end, till the terminal. During the ride we were very excited because we found a fast and cheap way to sight-see. This two story tram reminded us of Hop on Hop off buses. It is tall and if you sit on the second floor by the window (you can open it) you get an exciting ride through Hong Kong island. You see busy street life, a lot of people, a lot of tall buildings. Especially spectacular it looks in the evening, when all the lights are on. 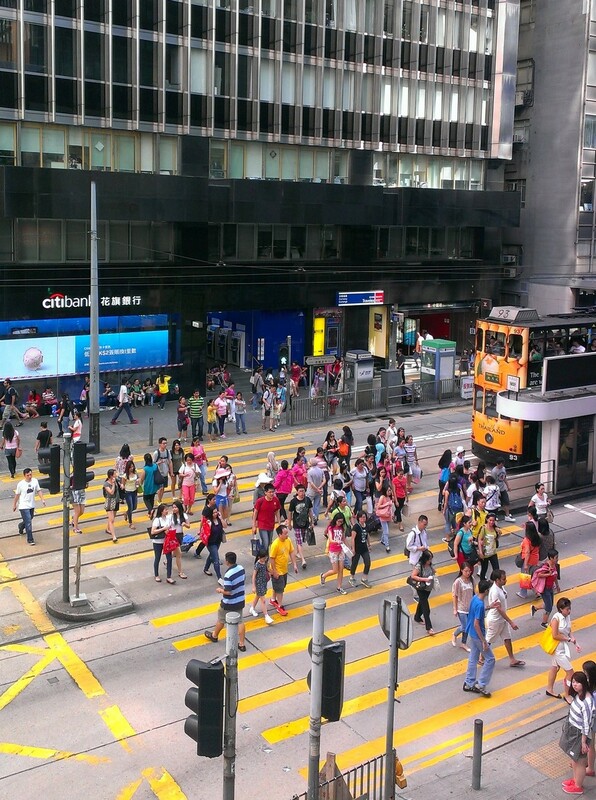 But this tram has only one line – on the Hong Kong island. 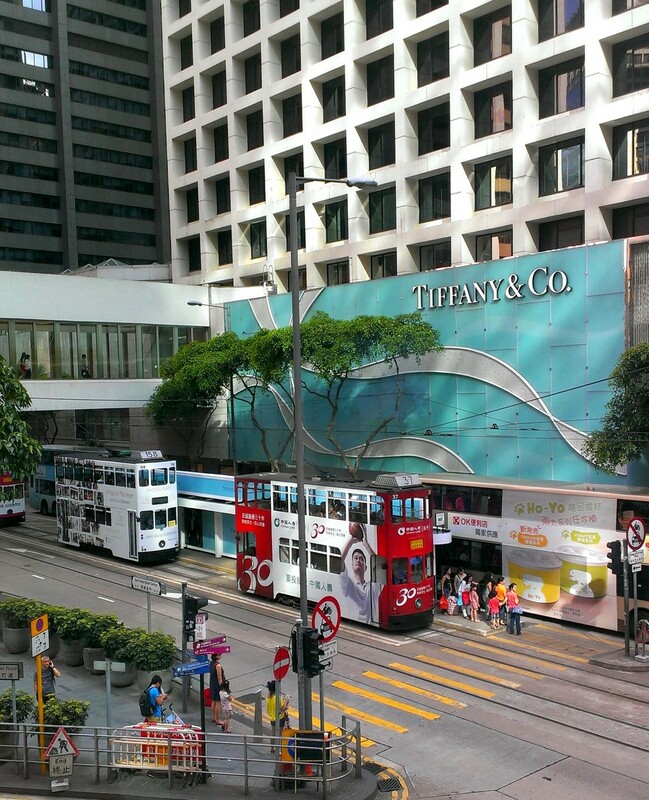 There are a lot of buses in Hong Kong. Most of them are big and two story. But there are also small, one story buses. 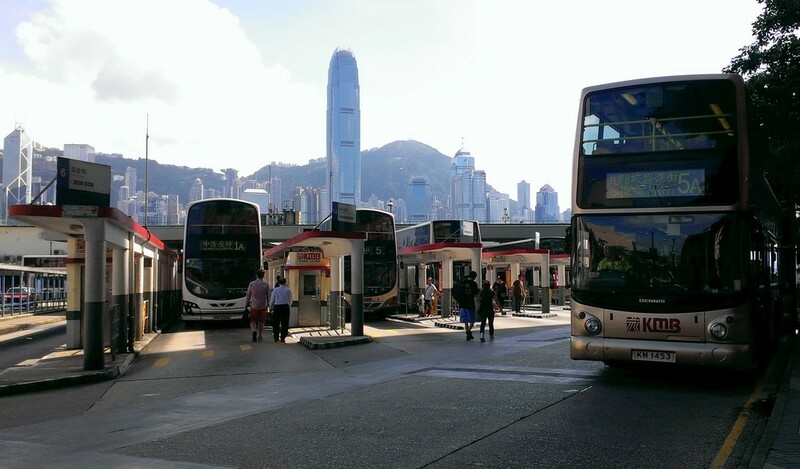 There are city buses and buses on which you can get out of the city, to rural parts of Hong Kong. 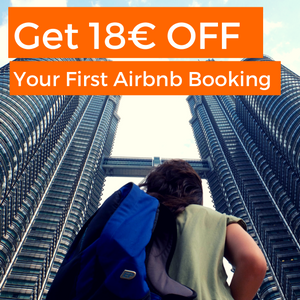 Bus ride fares varies, we usually paid only about 0.65 EUR for quite long distance bus rides. But if you want to go to the Hong Kong airport by bus it will cost you about 3 EUR, which is much cheaper than metro ride. 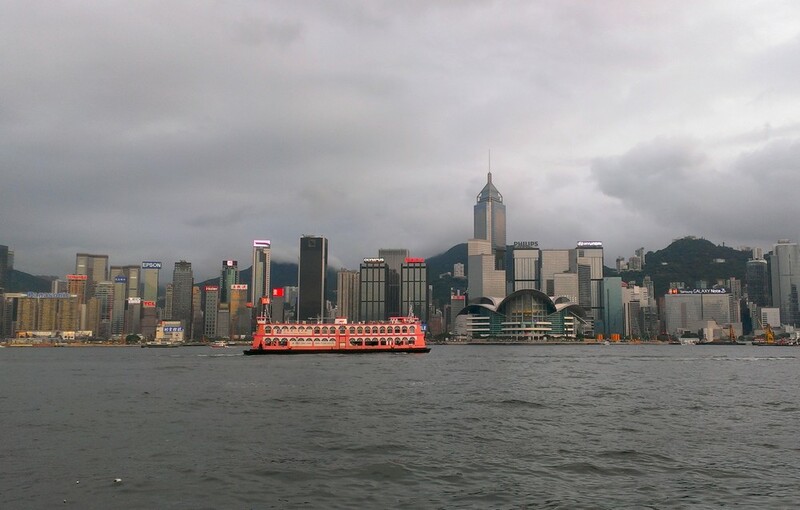 There is a ferry (Star Ferry) going from Hong Kong Mainland to Hong Kong Island and back. The ride costs only 0.2 EUR. This is two times cheaper than going from the mainland to the island (or back) by metro. There are other ferries operating from the ferry piers on Hong Kong Island. You can get by ferry to Peng Chau, Cheung Chau, Lamma Island and Lantau Island. There also is a ferry between Hong Kong and Macau. Yes, public transport system in Hong Kong is comprehensible and there wouldn’t be a problem to get around using public transport. But that can not be said about getting around Hong Kong by foot. Why is that so? There are a lot of skyscrapers and many of them will seem alike to you. You will be standing in the middle of the jungle where instead of trees are tall buildings. And not only this. There are a lot of sidewalks, pedestrian tunnels and viaducts, and most of the times they can seem pretty confusing to you. That’s because they won’t lead you straight across the street. No, my friend. They will take you a few blocks ahead, then lead you over a pedestrian viaduct, then through a mall and then finally you will get “across the street”. Yes, that is true! Or – at least that’s how we felt there then, on our first visit to Hong Kong. 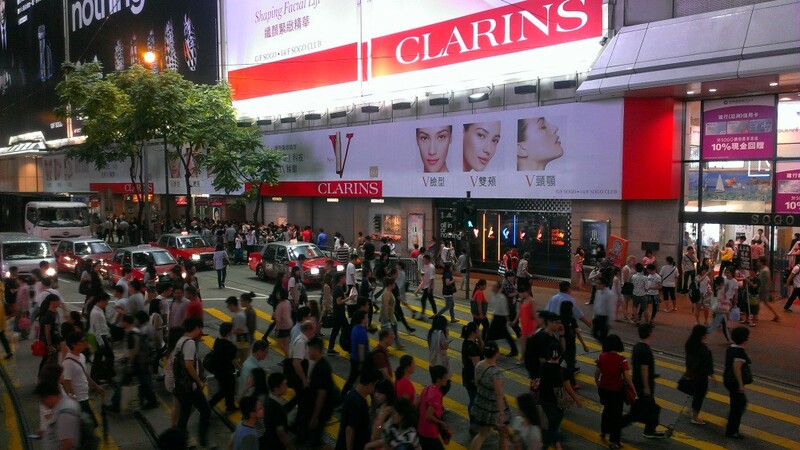 Well, don’t be afraid and take a walk during your stay in Hong Kong. Not always getting around by foot will cause you a trouble. There are also some pedestrian crossings which actually lead you across the street. Haha. Like the one in the photo below. We went to Hong Kong (Honkers) earlier this year and my boyfriend actually studied there. We highly recommend getting activating and doing some hikes!